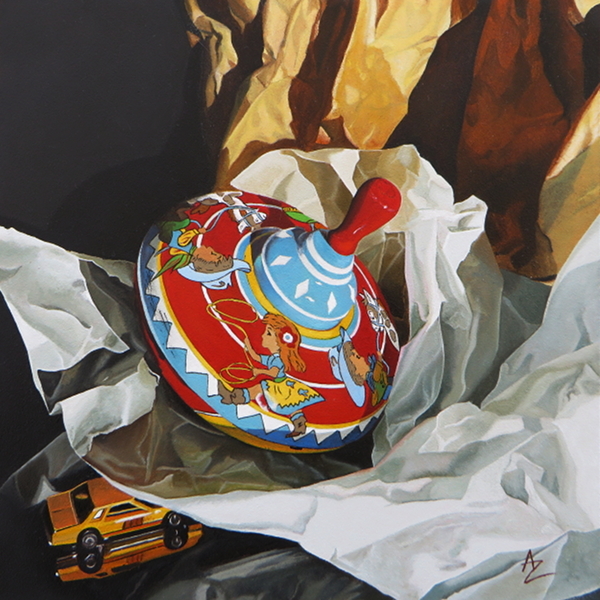 First painting in 2015 – Spintop. It is also the last installment for Unwrapping exhibit that will be opening in Mostly Glass gallery this weekend. I am happy and a little scared. Wish me luck! Many people ask me ask me how long this style of painting takes? I usually tell them – long. It takes a long time, several weeks. A couple or three months if a painting is larger. But how long is long exactly?! I decided to time myself and find out. So I painted with a stop watch for several weeks, and now can report to you that this 6″x6″ painting took me 52 hours: 7 hours for composition, prep work and drawing, and 45 hours of painting. I started composition work on November 29 and signed the painting on January 27 – almost two months, but holidays got in the midst and there were literally a couple of weeks that I did not paint at all. Alex: this is beautiful! You should do very well at the exhibit this weekend. Best of luck, but really? You don’t need it! Hi Alex! All the best for your opening. I have no doubt that it will be very well received. Thank you for stopping by and leaving a kind word, Paula! I hope so too! Beautiful Alex. I have a vague recollection of playing with toys like that. I like the little yellow car too. Reminds me of a taxi.